Some companies are different, others even more. EclectiC has always been a company with a difference – in the most positive way. Clients realize that as much as employees do. It’s the way of treating each other – employees, clients and candidates – that makes it a special proposition. These habits might have little meaning to most people but they are an inherent part of company life and team spirit. You might wonder what habits I am talking about. Well, it’s nothing great and extraordinary. It’s more a confirmation of the company’s values translated into little cherished customs. EclectiC is a people company, so we try to make people happy while working. This counts for everyone we are dealing with and also for us as a team. Every time one colleague of ours introduces EclectiC to a potential new employee he speaks about the three fixed moments of a typical EclectiC working week that ideally every member of the team participates in: The Monday Morning Meeting (10 am), the Friday Afternoon Drinks (5 pm) and Lunch (at noon, sharp! :-)). Well this is all true, but there is something else that might be less ordinary: The after-lunch team walk! Admittedly this habit is a bit dependent on the weather conditions, but it’s kept up steadily throughout the year. How did it come up? EclectiC has been located in an old manor in the green suburbs of Breda for many years where the environment simply invited people to go outside and take a walk – after lunch mostly, but we have also had some “walking meetings” in that times. Why did the management support it from the beginning on? Well, the health benefit of walking are quite obvious, right? The workout is good for people’s bodies and brains. It supports the creativity, productivity and concentration of people. It makes people think broader because they leave their focused working area for quite a while in order to breathe and move. The best ideas typically come up while doing something else… the same principle applies here. Getting back to the office, people are re-energized, full of new thoughts and don’t mind sitting for a longer period again. The balance is back. Anyway, there is more to it. It’s a kind of team building tool. People do a light workout together while talking – it could be business talk but often enough other – more personal – topics come up. People get to know each other in a different way and connect on another level. It has kind of the same effect as doing a fun offsite day – with even more effect. Why? Because it’s frequent, it arises naturally. People don’t feel the constraint, they just do it out of their own motivation. That’s the strongest driver! So what to answer if people fear that precious working time might be spent while having a walk? 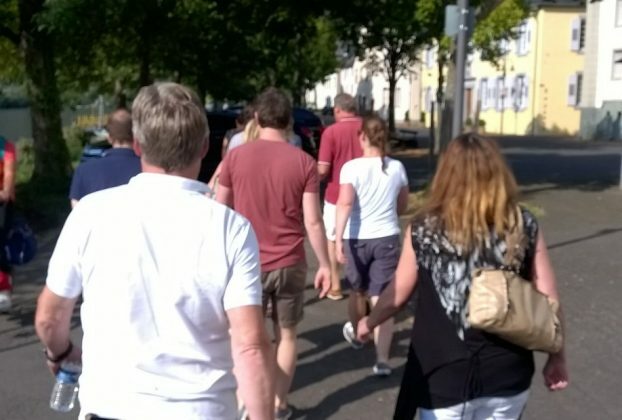 Well, most walking time is spent in the break hour anyway, but yes, it can happen that the walking time is exceeded a bit due to good weather or especially vibrant discussions. No reason to worry – it has been spent well and in advance to the company! Walking time is quality time in many respects! Let your teams move!